Sugar cookies are sort of my thing. And after I mastered paleo sugar cookies last year, I continue to update it as seasonally necessary. Yes, sugar cookies are necessary. Ask my kids. You can find my newest iteration in the pumpkin spice cookies version below! In pumpkin spice cookies, of course. But not just any cookies. 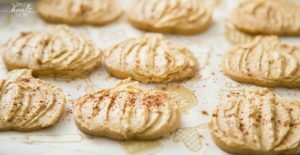 My paleo sugar cookies are a family favorite. I can barely stop myself from running to the kitchen and whipping some up now, just writing about them. But I’m exercising self control because if I do that, you’ll never get this recipe, and you need this recipe. 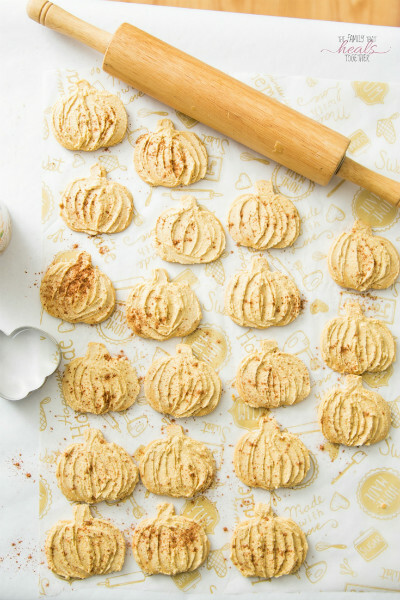 C’mon, fall, it’s pumpkin spice cookies time! So here we are, coming up on the end of October, and it was so hot here in Houston today that my kids wouldn’t play outside. Funny… Mr. Incredible traveled up to the mountainous wilderness of Wyoming last week and frolicked in the snow. He shot himself a big ol’ elk that I can’t wait to get my hands on and cook up. I hear elk meat is some of the tastiest, though I don’t recall tasting it myself. But I’m also in the mood for things like pumpkin spice cookies and ice cream. Below, I’ll give ya one of ’em so you can make ’em too (even if it is actually cold where you live!). Add the maple sugar, pumpkin spice and baking soda, and beat once more until combined, scraping the sides to mix well. Beat in the egg, pumpkin puree, and vanilla. Place a large piece of parchment paper on the counter and place the ball of dough on it. Flatten it out and place another piece of parchment paper on top, then carefully roll it out to 1/4" thickness with a rolling pin. Don't press too hard or the parchment paper will stick. Remove top piece of parchment. Use cookie cutters to cut out festive shapes, then carefully transfer them to a parchment-lined baking sheet with a spatula. Space cookies 1-2" apart before baking on the top rack for 10-12 minutes, until edges become lightly golden. Meanwhile, repeat cookie cutting process with remaining dough by combining dough scraps into a ball and rolling it back out. Bake remaining cookies. Allow cookies to cool before transferring them to a serving dish. Frost using one of the options below. 1/4 cup ea butter and cream cheese, softened but cold 1/4 cup thick, raw honey 1 tsp vanilla Combine ingredients in a medium bowl and beat on high with a hand mixer, scraping sides, until smooth.